Dr. Alice Kirby is a Healthcare Strategy consultant. Alice enjoys delivering practical solutions to drive positive change for patients and healthcare professionals. In a time of great hype about the possibilities of advanced technology, Alice likes to cut through the chatter to help identify what can be done to make ambitious but realistic improvements. 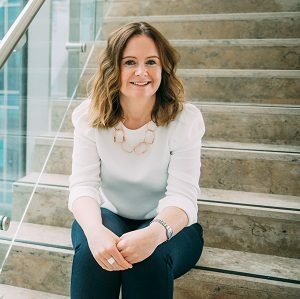 Having completed a degree in Commerce in UCD and a masters in E-Commerce at Bentley University in Boston, Alice spent 10 years in the financial services sector in a number of positions including fund management, product development, compliance and investment for both the retail and high net worth / private banking industry. Always passionate about great, innovative, functional design, Alice has trained as a tailor, milliner and is a craft council registered silversmith. A stint volunteering in a Zambian hospital inspired a change of career and after some time working in medical charity funding, Alice completed medicine in UCC. Alice left clinical medicine in 2016 to participate in BioInnovate, the national medical device design fellowship program in NUIG on the Mayo Clinic Cardiology team.